Beliefs and values, mission and objectives, attitudes, hierarchy, discipline, freedom, systems, skills, material things, coordination, integration, and harmony are all essential for sustained success in buisness. But what about the most important of all organizational resources-the individual? What is the significance of the individual in the life of a corporation? Historically, the most significant individual in the life of a company has been the founder or an outstanding CEO who came later. Such people have imparted the values and formulated the mission that set the company's direction. They have molded the corporate character and invested all their energies to make the organization come alive. Leaders like Rosenwald and Wood, Vail and Sloan, Woolman and Woodruff, Bata and Marriott and their descendants have created organizations as extensions of their own personalities and given them an independent existence. These people identified themselves so closely with the life of the organizations that, as it was observed of Tom Watson, it is difficult to say where the personality of one ends and the personality of the other begins. It was not money or position that made these leaders significant. It was attitude and effort-a willingness to give themselves to the organization and to work hard. Work was their religion. With characteristic humor and understatement, Woodruff once remarked: "It was not so difficult. It was mostly a matter of working all the time. Watson almost made it sound easy: "It isn't a hard thing to build up a business if you are willing to do a reasonable amount of work. Make no mistake about it, Watson's idea of "reasonable" was not 9 A.M. to 5 P.M. Nor was Bill Marriott, Sr.'s. He said, "No one can get very far in this life on a forty-hour week. I have succeeded in business not because I have more natural ability than those who have not succeeded, but because I have applied myself harder and stuck to it longer. I know plenty of people who have failed to succeed in anything who have more brains than I had, but they lacked application and determination. Edison's well-known remark sums it up best: "Genius is 1 percent inspiration and 99 percent perspiration. I resolved from the time I was a mere boy to do a big business. I loved business better than anything else. I worked from early morning until late at night. I was sorry to have to leave off at night and glad when morning came so I could set at it again. Admittedly, these individuals did share one characteristic in greater than normal measure, and that was energy. But where did their energy come from? It was itself a product of a decision, a determination, and an enthusiasm. Effort and commitment are the twin keys that release the energy stored up within the human personality. The effort and commitment are the result of a decision. The decision is the expression of an idea. The idea is an idealistic value or a high, distant goal. The idea fixes the direction, the decision sets it in motion, the effort and commitment carry it forward, and the enthusiams lifts it to success. A high idea, a clear decision, a firm commitment, and an overflowing enthusiasm released the energy of these individuals and transformed it into intensity. The process these leaders passed through in achieving success is familiar to us, for it is exactly the same in the individual as it is in the company. Individual personality and corporate personality follow the same path in their development. It has been the thesis of this book that any company that has the knowledge of the process and is willing to make the effort can achieve enduring success. Therefore, it is only logical to ask: Can any individual with a similar knowledge and making a similar effort achieve lasting significance? He or she can indeed. Enduring success for a company and lasting significance for the individual both have the same source. It lies in the undiscovered potentials of personality, individual and corporate. In truth, the greatest discovery that significant individuals have made was not the unlimited power of organization, though all of them released at least a tiny portion of it, but rather the unlimited potentials of human personality within themselves. They were not so much great leaders possessing great power as they were individuals in whom great power was released, making them appear great. Any company that really wants to achieve enduring success can achieve it. Any individual who really wants to become significant can become so. The emphasis is on the word wants, because it is "mostly a matter of working all the time," as Woodruff said. Man is distinguished from all other resources in that his "development" is not something that is done to him; it is not another or better way of using existing properties. It is growth; and growth is always from within. The work therefore must encourage the growth of the individual and must direct it-otherwise it fails to take full advantage of the specific properties of the human resource. Contrary to what many believe, life in an organization presents excellent opportunities for individual growth, because people grow primarily through work and social interaction, which are the basis of corporate existence. The greatest benefit an individual can derive from work is the growth of his or her personality to make the person better, stronger, more productive, and happier. The greatest benefit a company can derive from its people is to foster their personal growth, so that their energies and talents can be made fully available to enliven and enhance the life of the organization. General Wood once reminded his staff at Sears: "We must always consider our 150,000 employees as 150,000 individual human beings, with personalities of their own...who have faith in their leaders, who believe not only in their ability, but in their fairness and justice, and who in return give of their best, freely and willingly. If all of Sears is animated by this spirit, nothing can stop us. What makes an individual significant? We are all significant individuals in our own personal lives; but although most of us like to think so, very few are really significant in the life of a company. Sure, many of us do excellent work, receive recognition, move closely with our boss. Some of us have made a very important sale for the company on occasion or helped develop a new product or a new process. When a special talent or skill is required, many are sought out for their capacity-a crack sales rep to handle a big customer, a bright lawyer for a tough negotiation, a brilliant engineer to solve a difficult technical problem, a knowledgeable accountant to bring order out of chaotic numbers, a manager with a way with words to handle an irate employee or customer, a secretary with a flair for creating advertising copy or drafting letters, a supervisor who inspires subordinates to work hard. These are notable accomplishments for any employee, but they are not what we mean by being a significant individual in the company. A significant individual is one whom the company needs for its work, not one who needs the company for his or her living. Bill Marriott, Jr., is a significant individual who everyone agrees works harder than anyone else in the company. Why, we asked? To set an example, "so everyone else will work hard," he replied. Telling and Brennan are significant individuals at Sears, who have a vision of the future and are guiding the company to realize it. Goizueta is a significant individual who has directed Coca-Cola into new fields. So is Steve Jobs at Apple. They feel the work is more important than they are, and they sacrifice their personal convenience in favor of the work. That is why significant people are never nine-to-fivers for five days a week. They are like C. E. Woolman, of whom it was said, "Delta Air Lines was his life. They always think about the work that is yet to be done and do not dwell on past achievements. They are not really looking for external recognition and rewards, although both always come in abundant measure. Their real motive for work is the challenge of accomplishment and the sheer joy of growing. They love work because it is its own fulfillment. "I had always enjoyed going to work," said Geneen. "In fact, I never thought of it as work. It was a part of my life, a part of the environment in which I lived and breathed.... Business could be a great adventure, a lot of fun, something to look forward to every day, and the rewards went much further than one's annual salary and bonuses. They do not just work long hours or spend all their energy. They constantly strive to acquire new skills and to shed present weaknesses, so that they can perform at the highest possible level. They are never satisfied with themselves and always want to be better than they presently are. They try to continuously raise the peak level of their performance. They are constantly being sought after by the company to take on new and higher responsibilities and constantly being catapulted to higher levels of the organization or to larger organizations and greater rewards. Many individuals possess one or two of these attributes. There are a number of people who come to work an hour early and leave three hours after closing and work on weekends, too. But that alone is not enough to be significant. They must also work at their highest possible level all the time by developing new capacities, not just work hard and long at what they know or do best. There are many who like their work and the people they work with, the travel, the conventions, the challenge of making a sale or designing a better product, but that, too, is not enough unless they feel the joy that comes from constantly growing. There are people who may even meet the first four criteria-they may be hardworking, always striving to improve, thinking only of the work still to be done, and feel refreshed and enthused by what they do-yet still not find new opportunities and greater rewards thrust upon them because they do not understand the process by which people grow. They have the goal, the willingness, the urge, and the right attitude, but not the knowledge of how to convert their hidden talents into developed capacities and to effectively express them in action for the good of the company and their own personal growth. This book is especially intended for companies that really want to achieve enduring success but do not know the process. This chapter is especially meant for individuals who really want to become significant but do not know how. No individual by virtue of birth, family, wealth, or social position has a monopoly on achievement, any more than any company by virtue of size, resources, or influence has a monopoly on success. Any company at any level can prosper and grow to one, ten, a hundred, or a thousand times its present size. Sears started with nothing and accomplished it over half a century. Apple started with nothing and did it in less than a decade. Whatever the size, whatever the field, there are no limits to growth. We have all known many people-childhood friends, college roommates, office colleagues, or neighbors-who seemed to be just like us; yet inexplicably, by some stroke of good fortune or particular talent, they shot up in life to a far higher level. To the astonishment of long-time Sears employees, Edward Brennan was promoted to head the merchandise group at the young age of 46 and became president at 50. Brennan started as a salesman in a Wisconsin Sears store in 1956. Ron Allen, an engineer, joined Delta in 1963 doing part-time drafting work and came up through the personnel division to become president in 1984. Don Craib joined Allstate as a claims adjuster in 1950, then became a field manager, and gradually worked his way up till he reached the chairman's post in 1980. Roberto Goizueta, Coca-Cola's Cuban-born chairman, joined the company as a chemist 30 years ago and moved up through the ranks of middle management. At General Mills we met a young marketing director who joined the company just eight years ago as an intern while still in graduate school. She has already been promoted four times and seems headed for a vice-president's job in the near future. If your own career has not been quite so meteoric, still there may have been a period when you made rapid progress. If you recall now what happened at the time, the urge that drove you forward, the effort you made, the self-discipline you exercised over yourself, the steps and stages you passed through in developing a talent or acquiring a skill, then you get a glimpse of the process by which individuals become significant. There is a process by which people rise, though many may not be consciously aware of how they have done it. It is not a process meant only for one in a million. It is available to all who really want to achieve and are willing to make the effort. According to psychologists, people utilize only 10 percent of their mental capacities in living a normal life. They also use only a tiny fraction of the energy and abilities their personality is capable of expressing. When individuals release this potential energy and develop these latent talents, they grow. When they channel all that energy into work and express all those talents in their jobs, they become significant. According to Richard Wytmar, president of an executive recruiting firm, any manager can become an "indispensable executive, provided that the manager is willing to make the effort to develop his or her capacities and that he or she takes a positive attitude toward the work. There is a way. There are certain conditions and prerequisites required to become eligible for any great opportunity in life. The opportunity to become significant is no exception. First of all, you have to know where you are and where you want to go. You have to ask yourself, as Wytmar suggests, What are my strengths? What are my weaknesses? How do my skills compare with those of others who have risen to higher levels in the organization? Do I possess all the skills that my boss possesses or that his or her boss possesses? "If you want to move ahead, you've got to look around your organization and ask yourself what kind of skills you need in order to make the move to other positions," says Wytmar. "Then you must acquire those skills and demonstrate the ability to handle broader responsibilities. What are the attributes required to become significant in any job? There are many, and they are well known: punctuality, orderliness, systematic functioning, a capacity to make decisions, a willingness to delegate authority and responsibility, an ability to communicate clearly and pleasantly and to motivate people, self-discipline and self-restraint, cooperation with others, loyalty, integrity, and so forth. Recognizing strengths. All managers possess certain of these attributes in some measure, and by virtue of these qualities, they have reached their present positions. Exercising one's existing capacities is living, but it is no way to grow. Expressing a known ability is acting out of habit. It is easy and gratifying, but not challenging and energizing. It is energy that makes for growth and advancement, and energy comes from the effort to release latent capacities and to acquire new skills, not to repeat what one already does well. People who always seek out opportunities to express their present skills may be very successful at the present level, but they are likely to remain there. Their bosses may even openly say, "You are the only one who does this work well. I cannot afford to let you go to any other job." Such people have the satisfaction of knowing they are appreciated and wanted, not the challenge of growth and the opportunity for advancement. In other words, progress comes from developing new capacities rather than exercising old ones. Identifying weaknesses. Developing new skills and capacities is not enough for continuous progress. One must also continuously seek to overcome one's present weaknesses. Knowledge of your strengths must be balanced by a knowledge of your weaknesses as well. As most people like to exercise their existing talents, they also like to avoid doing anything they are not good at. Often they do so under the excuse, "That work does not suit me. "Weaknesses are of many types. Each one corresponds to an absence of a positive attribute listed above. Some people are perennially late; others, notoriously sloppy. Some have disorderly desk drawers; others, disorderly minds. Some are lax with their subordinates; others are lax with themselves. Some are poor communicators; others never stop talking. Some are too harsh in dealing with people; others are too soft. Some do whatever is asked of them even when they know it is wrong; others do not like to follow an instruction even when they know it is right. Some insist on doing by themselves work they should delegate; others delegate responsibilities that they should look after themselves. Some managers ignore the genuine personal problems of their sub-ordinates; others get too personally involved to be effective managers.There are many other weaknesses that directly undermine efficient functioning and prevent a person from advancing. Any and all of them can be removed by a determined effort. When even a single new skill is acquired and one weakness is removed, individual energy and performance increase enormously and the person moves up in the organization, usually several levels at a time and far beyond all expectations. Psychological effort. Becoming significant is not just a question of working hard or being busy all the time. Almost everyone is busy all the time doing something or other. The effort required here is to work always at the highest level possible rather than simply putting in long hours doing routine work. It is more a psychological effort than a physical one. It requires a constant exertion of the will, not just the muscles. It involves exercising control over one's own temperamental traits, restraining unwanted behaviors, and making the effort to act in the most appropriate manner. It demands discipline of old habits and active initiative to acquire fresh ones. It involves becoming better informed, thinking things through before you act, and making decisions expeditiously. When people work hard physically, their present functioning improves. When they make a psychological effort, they rise to a higher level of functioning. The task of managing a multinational corporation involves managing the components of which the company consists-ideas, organization, systems, skills, technology, finance, products, and markets. The task of managing a division of that corporation involves managing exactly the same components; only the quantities and degree of responsibility may differ. The same is true of managing a department of the division. At all levels, from the very top to the very bottom of an organization, the components of management are the same. Each of these components consists of several subunits. Ideas include beliefs, values, missions, objectives, standards, policies, plans, and attitudes. Organization consists of departments and the people within them, hierarchy and authority, rules and regulations, and so forth. When all of these subunits are analyzed further, they can finally be reduced to certain basic, essential elements of management-time, people, information, money, machines, materials, and energy. Regardless of the level of the organization, these are the essential elements, and effective management of them requires certain capacities. 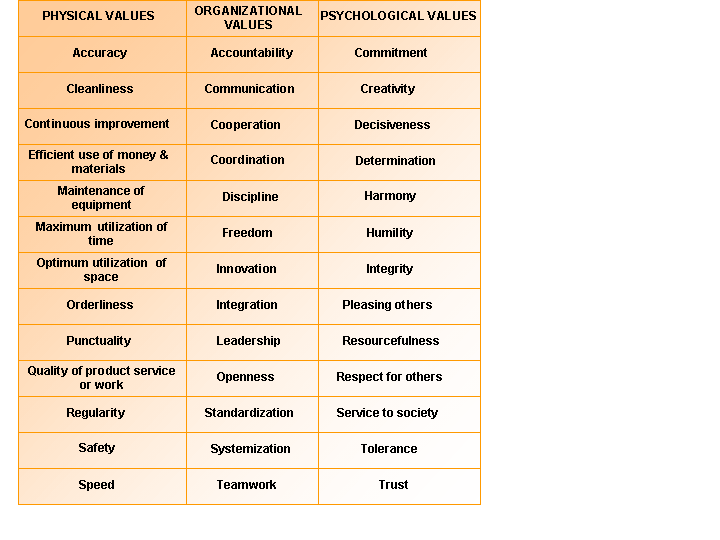 These capacities are defined by the corporate values . The values of a department and the values of a corporation are the same. In the last analysis, what do individual managers do? They strive to be clean and orderly, to be punctual and use the time available in the most efficient manner, to conserve materials, to utilize space properly, to maintain equipment, to improve quality in every aspect of work, to function systematically, to coordinate with colleagues, to integrate with those at higher and lower levels of the organization, to minimize expenditures, to discourage negative behavior and encourage positive behavior among subordinates, to serve customers, and so forth. The same values that govern the company, the division, and the department govern the conduct of all managers in carrying out their jobs. Corporate values, departmental values, and individual values are the same. For the manager of a department, that department is the company, and the manager is the CEO of that department. The manager's task is to manage corporate values within the department. The manager's position is exactly analogous to that of the CEO outlined in Chapter 3. The manager has to accept those values, decide to implement them, create a suitable structure for implementation, define performance standards for each value, design or operate systems to achieve the standard, recruit the appropriate people and impart the necessary skills for implementing the values, coordinate and integrate activities, communicate with subordinates, and relate realization of the values to the personal growth and fulfillment of each person in the department. All that has been said in this book about the company applies to the individual as well. Value implementation begins with the CEO and ends with every individual in the company. Every person who identifies with the values of the corporation and strives to implement them can become a significant individual in the life of the company. There is no capacity that is required for management beyond what is embodied in these corporate values. There is no work that cannot be accomplished through them. The task of all managers is to manage the organizational resources put at their disposal-including their own time, ideas, systems, people, decisions, skills, and so on-as well as they possibly can. Those that strive to personalize the corporate values as values in their own life and for their own personal growth find themselves identified with the psychic center of the corporation, one with it in value. Their actions are closely attuned to the corporate objectives. Their personal attitudes are in harmony with the attitudes of the corporation. Their personal growth is linked to the growth of the company. As it rises, they rise. As it becomes successful, they become significant. The more they give of themselves for the benefit of the company, the more valuable and significant they become in it. The more sincerely they serve it, the more rapidly they rise within it. They do what was done by IBM's CEO, John Opel, who "achieved the top post by molding himself to be just what the company wanted, because that is exactly what he wanted too. And if by circumstance these individuals find themselves within a company that is not willing to grow or appreciate their service, they find greater opportunities calling them elsewhere. They continue to rise, even if the company does not. Take an ordinary day at work. The boss calls you in to find out how things went wrong or why the target has not been reached. Your sub-ordinates question your instructions, and your colleagues criticize your decisions. Your assistant tells you that your most original idea is merely "all right." An important customer complains about slow delivery or poor service. What if all these ordinary moments could be converted into great ones? Suppose your assistant, who never appreciates any of your ideas, comes forward to say they are "wonderful." Suppose your boss calls you in to praise you for a job well done. Suppose your colleagues commend all your decisions, and your subordinates execute them with enthusiasm. Then ordinary moments become unforgettable; work becomes fresh and fulfilling. Life becomes rich and rewarding. You become a center of intensity. For that, there is a process-the process of translating values into actions in one's own life. Values are the criteria by which we measure the quality of our actions. In the individual as in the company, there are a series of stages through which we pass in the process of fully establishing any value in our lives. The process of value implementation in a company is analogous to the process of personal growth in an individual. In both cases the personality develops, becomes more organized, better utilizes its capacities, and expresses them more effectively in action. Consider, for example, a simple corporate value like punctuality. "Punctuality," says the proverb, "is the soul of business." Without it, service cannot be prompt, efficiency cannot be high, prices cannot be low, and profitability cannot be maximized. As obvious as this may sound, punctuality-in starting work, attending meetings, completing schedules, answering letters, returning phone calls, producing products, attending sales calls, shipping goods, invoicing customers, maintaining accounts, and paying bills-is not so very common as one might think. A recent issue of General Mills' Family magazine dramatized this point with an article entitled "What Time Does a 10 O'clock Meeting Start?" It requires a comprehensive and perpetual effort of the entire organization to maintain this one simple corporate value. Punctuality is a value as important for a manager as it is for a company and as difficult to establish and maintain. For instance, take Bill, a fictional but typical manager representative of many we know. Bill commutes by train 40 miles into New York every morning and consistently arrives 10 to 15 minutes late. One day he finally gets tired of displeasing his boss and being laughed at behind his back. He decides to make it a point to arrive on time. To do so, he has to catch the next earlier train, which leaves his hometown 30 minutes before his present train. For that, he has to wake up and shower a half-hour earlier, too, which just happens to coincide with the time his wife takes her bath. She agrees to readjust. Under the new schedule, Bill's wife is bathing while he is dressing, and there is no one to cook his breakfast, so he has to get up even earlier to scramble the eggs. By the second or third day, he is feeling quite fatigued from losing 45 minutes of sleep every night, and he sleeps right through the alarm. Bill then realizes that he must adjust his bedtime and retire earlier in order to get enough sleep, which requires a number of adjustments with his wife and children regarding dinnertime, keeping the TV volume down, and other family matters. After a week he really wonders whether it is worth such an effort and inevitably decides that it is not. What Bill failed to observe was that his effort made him more alert and brisk during the day, a better listener in meetings, a little faster with the paperwork. He had activated his will to achieve a goal and been energized by the endeavor. Had he persisted and extended the discipline of punctuality to other areas of his work like attending meetings and replying to letters, he would have found his overall efficiency raised by 5 percent to 10 percent. All his colleagues and subordinates would have been commenting that he was a "changed person," without being able to pinpoint what was actually different. Fortunately, our manager decides to try again with greater determination in order to establish punctuality in his life. His effort takes him through the following stages. Until his boss started to complain and his colleagues began to joke with him about always being late, Bill was not even aware of his own deficiency. Previously he had thought that he was about as punctual as anyone else, but he now begins to notice that most other people are actually far more punctual than he is. Thanks to pressure from his boss and his peers, he gradually becomes conscious of the fact that lack of punctuality is one of his weaknesses. He has acquired a new knowledge. After observing himself and others for some more time, he recognizes that punctuality is a far more important value than he had thought. He realizes that he must acquire it if he is to move up in the company. He feels a strong urge to overcome his deficiency, and he resolves to do so. He has made the decision to acquire a new value. He speaks of this decision to his family and a few friends and is surprised when almost all of them laugh at his resolution. They are all sure he will soon forget it and remain the same old person. Their ridicule strengthens his resolve. He makes a promise to himself that he will become punctual. He has converted his decision into a firm commitment of his will, and he begins to practice his resolution seriously. The more he thinks about his past behavior, the more he realizes how many problems and how much tension are generated by this one bad habit. The very thought of overcoming it makes him feel happier. Each time he succeeds in being on time, he feels a sense of accomplishment and greater confidence. He is exhilarated by the challenge of becoming a punctual person, and his enthusiasm is released for the effort. One day, after complimenting himself for arriving at work ten minutes early, he sees a note on his calendar reminding him to file his quarterly department report the following day. He has not even begun to draft it. It suddenly dawns on him that punctuality is a value that applies to every aspect of his work, not just arriving at the office and attending meetings on time. He decides to draw up a list of each recurring task he has-like replying to letters, filing travel expense reports, and returning phone calls-and he establishes a standard for completing each one of them within a stipulated time. During the first week of his effort, our manager stays at the office every night until 8:00 or 9:00 working on the day's correspondence and other tasks that he could not complete during normal working hours. He realizes this cannot go on forever. He begins to examine his working day to find out how all his time is being spent and discovers that much of it is taken up by small talk with colleagues in the corridors, unscheduled intrusions by subordinates, and meetings that spill over the allotted time. He decides to eliminate all unnecessary distractions. Setting aside a fixed hour every day to answer correspondence, he issues orders that he not be disturbed during that period, except for urgent matters. When colleagues fail to end meetings at the appointed time, he promptly excuses himself-even in the middle of an interesting story about the CEO's troubles with his wife. When subordinates come in to complain endlessly about others, he disciplines himself to end the discussion quickly. He has learned to set rules and regulations governing his own conduct in order to be punctual. By this time our manager has already become the talk of the whole division. He looks five years younger, walks briskly, needs less sleep, and thinks more clearly. But still he runs into problems maintaining punctuality on many occasions, such as when customers call on the phone, a colleague comes in to chat, or he has to write a report-reports were never his strong point. But gradually he discovers ways to handle phone calls politely in less time. He learns how to lead a casual conversation with colleagues onto a serious topic that is useful or bring the discussion to a quick end. He asks a friend to help him improve in report writing. He acquires new skills needed to implement his value. Though vastly improved, he still finds he is late to 25 percent of meetings and behind schedule on work 30 percent of the time. He realizes that he needs to organize his entire day more carefully and develop means to complete his work more quickly. He works out systems for processing mail, issuing instructions, delegating tasks, and receiving reports. His productivity improves dramatically. His own routine work is now under fairly good control. But when it comes to work with his boss, subordinates, and colleagues, things do not fit into his systems. His assistants keep interrupting him to deal with their problems. His colleagues keep calling him at unscheduled times to discuss interdepartmental affairs. He asks his boss to allot him a specific appointment several times a week to discuss the affairs of his department. He decides to allot 15 minutes at a fixed hour every day for each of his assistants to meet him to discuss their work. He arranges a regular 30- minute meeting with colleagues once a week to discuss subjects of mutual concern. He has coordinated his systems with the activities of colleagues and integrated them with the activities of people working over and under him. By now he is able to achieve his standard for punctuality 80 percent to 90 percent of the time. He finds that he no longer has to rely so much on rules and systems to be prompt. He always makes a conscious effort to be punctual in everything he does. The value has become institutionalized as part of his behavior, something he always expects and demands of himself. After some time, he finds that he no longer has to strain himself and struggle to be on time. He notices that punctuality has become a customary way of behaving, something he accepts as an essential part of doing his job properly. Even when his boss is away on a trip, he continues to maintain punctual behavior and succeeds 90 percent of the time. By now he has become known as a serious worker, an upcoming star, a man who is going places in the organization. His whole department functions briskly. Work flows smoothly. Productivity reaches a new high. One day he suddenly realizes that he never thinks of being punctual any more. It has become natural to his way of functioning. But he also has become less rigid and obsessive in his concern for being on time. He has noticed that often the most wonderful opportunities come as an interruption precisely at the moment when he is striving to keep to a schedule. He realizes that punctuality is only one among many corporate values and that sometimes it has to be sacrificed to others that are more important. When his assistant comes in with a very serious personal problem, he puts away his watch and forgets his schedule. When a customer gives him a very good idea for a new product, he cancels three meetings in order to follow it up at once. Our manager has made the value of punctuality one of his own personal values and integrated it with the other important values of his personality. Our manager, who less than half a year before was being laughed at by his peers and scolded by his boss, is now a different person. His efficiency has vastly increased. He feels younger, more energetic and alive. His work is no longer a pressure or a strain. It has become a constant source of enjoyment. Like Duke and Geneen, he goes to sleep every night eager for morning and for another day to begin. By the way, do not look for him in his old office anymore. He was called long ago to a higher job, where he is now struggling to acquire another one of the company's most important corporate values. He became conscious of his weakness and acquired knowledge of the importance of the value. He made a decision to adopt the value. He made a commitment of his will to express the value in his life. His enthusiasm was released for the effort of acquiring the value. He established standards by which to evaluate his own performance with respect to the value. He devised rules and regulations for his own conduct to help him reach the standard. He developed systems to organize his activities in order to achieve the value. He acquired the skills needed to implement the value. He coordinated and integrated his systematic activities with those around, above, and below him. He maintained the value by a constant, conscious effort in everything he did, no longer needing a particular system for support. He acquired an institutionalized behavior of the company. He no longer had to struggle or strain to implement the value. It became a customary habit in all his work. He identified with the value as a personal one in his own life and naturally sought to express it in everything he did. It had become an integral part of his personality. This apparently herculean achievement of becoming punctual is actually only the starting point of our manager's quest for significance. He has discovered the process and acquired some experience. He begins to understand himself, his companions, and the company better. The way opens before him. By this time our manager is being talked about around the company as a truly exemplary person for his punctuality. He feels gratified and better for the effort. But in the process he has become aware of so many other areas in his work personality that need improvement. After all, punctuality is only a physical value, while he is working in a social environment where social skills and values are important. He also sees that to really perfect punctuality, he has to develop other capacities as well. One important area he has identified is communication. He has discovered, in the course of trying to manage time better, that he manages communication very poorly. For one thing, it always seems to take twice or three times as long for him to give instructions to subordinates or explain a point to colleagues as it takes others he has observed. Gradually he becomes aware that he is a perpetual repeater. He never feels he has fully communicated his point until he has repeated it three, four, or five times and notices his subordinates on the edges of their chairs or his colleagues rising to leave the room. He not only repeats a lot but often raises his voice very loud in order to emphasize a point. He begins to realize that the less sure he is of what he is saying, the louder he tends to speak; and the less clear he is about an idea, the more he tends to repeat it, as if to clarify it in his own mind by repetition to others. He also has observed that the president of his company is very soft-spoken, a man of few words, but those words carry a clarity, determination, and power for implementation. The manager vows to acquire this value, too. Anyone who meets our manager a few months later is amazed at the change. By a serious effort he has almost stopped repeating himself. He has read a few books on communication, attended a brief course on discussion skills, and practiced diligently. He has instructed his colleagues and subordinates to remind him whenever he starts to repeat and whenever he raises his voice above the normal level. He finds that people listen to him more closely than before and follow his instructions better. He has been able to reduce the time of an average meeting by 30 percent to 40 percent, making it much easier for him to stick to his time schedule. He works more efficiently and thinks with greater clarity. His boss has even commended the brevity and precision of his explanations. The manager has made significant gains in this area by a strenuous, constant effort. He has become conscious of more and more areas where he should improve in order to communicate effectively. He discovers that his communication skills are better when his desk is orderly and his thoughts are well organized. He notices at times that when he is too casual, lax, and informal with his subordinates, they do not listen carefully. When he maintains a certain distance, communication is more effective. At other times he sees that when he is in an irritable or angry mood, it disturbs the communication process. People respond more to his mood than to his words, so he struggles to control himself and be more pleasant. A proper blend of friendliness and seriousness seems to work best. He has found that a simple act of communication depends on many other values, like orderliness, authority, self-control, pleasant behavior, and so forth. Our manager also discovers to his surprise that often he does not listen to what other people are saying, and the discussion gets prolonged and confused by his lack of attention and receptivity. He finds that many mistakes are avoided, time is saved, and problems are caught before they become serious when he disciplines himself to be a good listener. For all the improvement, he still admires the great ability of his CEO to accomplish work effectively with far fewer words, in less time, and with greater ease than he himself is capable of. Sometime later when you seek out the manager, you learn he has again been promoted. He receives you very pleasantly in his new office, asks about your affairs, replies briefly and clearly to your questions in a relatively low voice, appears cheerful and relaxed during the discussion yet serious and businesslike even so. He not only listens closely to what you say but has acquired the capacity to look at things from your point of view rather than his own. He anticipates your concerns and evokes a strong sense of trust and confidence in his relationship with you. He has a new poise about him, a confidence and an energy that mark him as an unusual individual. You learn from one of his subordinates that he is looked up to by his staff and has vastly improved the performance of the department since he took over. Although we have abridged the narration of how the manager so dramatically raised the quality of communication in his work, he had to pass through all the 12 stages he completed earlier to become punctual. The only difference in this case was that he had more confidence in his ability to change and accepted the challenge with greater enthusiasm. He also saw much more dramatic results in his work because he was now striving to acquire a social value rather than a physical one. In the course of this effort, our manager has stumbled upon an earthshaking discovery about himself. He realizes that he does not know how to make decisions. His capacity for decision making is even less developed than his capacity for punctuality was when he began his effort at self-improvement. By now he also realizes that upgrading performance on a psychological value like decision making is far more difficult than improving performance on a physical or social one. But he also knows that the results of succeeding will be far more dramatic, both for his career and for his personal growth. With the experience gained so far, he proceeds to observe himself very closely in this realm and uncovers an area where he is completely disorganized and chaotic-his thoughts. He notices that each time a situation is presented to him for a decision, his first tendency is always the same-to postpone. Over the years he has acquired a whole array of very rational-sounding reasons for not making decisions. One of his favorites is, "I don't have enough information." He is surprised one day to come across a remark by Lee Iacocca that "most managers have too much information. Suddenly he realizes that lack of information is usually just an excuse for not making a decision. He also finds that he has a tendency to delegate to his subordinates decisions that he should really make himself, not out of a desire to help them develop but out of an inability to decide for himself. He hears one day that his boss had permitted a programmer in the computer department to select a $500,000 computer for the division, which turned out to be a very poor choice. When the mistake was finally recognized a year later, it cost the company several million dollars in terms of lost productivity and consulting fees to rectify it. The manager resolves not to make the same mistake himself. The manager's desire to be more punctual has prompted him to become a better communicator and a better decision maker. In the process he has learned to save an enormous amount of time. Each value depends on and supports the others. Our manager passes through several of the stages described earlier and by a very intensive effort achieves a moderate level of success. He has discovered that decision making is a skill that can be acquired by training. He also discovers that there is a system for it, a mental system, which can be developed by writing down the issues and the facts required to decide and taking action to gather the necessary facts. This clarity of thoughts enables him to abridge many long meetings with subordinates to a few minutes. Our manager has become far more decisive, yet in the process has uncovered another problem. Decision making not only requires information and clarity of thought; it demands a strong will, too. He finds that often he hesitates to make a decision that affects a subordinate because he lacks the strength to carry it out. He learns that confusion and indecisiveness often mask weakness. Fortunately, his efforts to date have already made him a far stronger, more confident, and more energetic person. He has learned that each time he exercises his will to make a greater effort, more energy is released, and he grows a little stronger. So, applying the same principle, he makes a tremendous effort to decide issues according to what he knows is right, even when it presents difficulties for him in execution. He sees that often he has told a small lie or permitted someone to suffer unfairly or has done something he knew was not really honest because he lacked the strength to be completely true to his convictions. Though the effort is enormously difficult, he feels a wonderful sense of relief, fulfillment, and joy, because he is doing the right thing and he is becoming a better person. When we last saw our manager, by prior appointment in his executive office, the experience was quite overwhelming. He was very open, friendly, relaxed, and personable. Though he assumed no airs or formality, he exuded confidence and strength. When he looked at you, his eyes were direct and penetrating, with a sparkle of life in them. He laughed easily and spoke softly, but warmly. Though he said only a few words, his every gesture and expression conveyed his meaning and intentions. When confronted by a subordinate with an important decision, he paused for a moment to review the facts, gave an instruction, and returned to the conversation as if nothing had intervened. He was alert, cheerful, fully alive. His being radiated a calm joy and quiet intensity. We knew we were in the presence of a very significant individual. The process we have described here with respect to three important corporate values can be repeated for them all. Although it may take a long time for some people to express a single new value in their behavior, those who apply themselves very seriously can accomplish it in a month. Managers who attempt it may observe that in the process they are acquiring many other values in greater measure, too. If they make a similar effort to express other corporate values as well, they will find that in the process those capacities they already possess will become more perfect. The growth of a company like Apple from $1 million in sales in 1977 to $1.5 billion in 1984 required an enormous effort by countless individuals. The effort required is proportionate to the result desired. If a person wants to rise ten levels higher within a company, the effort he or she must make is tenfold greater than before. Normally, people and companies make such efforts only in times of crisis to preserve their jobs or avert bankruptcy. This is what Lee Iacocca and Chrysler Corporation did in the early 1980s. Had Chrysler made the same effort earlier, the crisis would never have arisen in the first place. According to Rick Wytmar, an executive search consultant, there has been a 30 percent reduction of middle management positions in the United States over the past ten years. Therefore, he urges managers to make the effort to improve their productivity and become indispensable in the face of increasing competition for their jobs. An effort based on insecurity and fear can certainly generate results. But the moment the sense of insecurity is removed, the effort will cease, because it is only a reaction to pressure from outside. A negative motive like fear cannot sustain a long-term effort for personal growth. The effort to become a significant individual can also be motivated by a drive for personal achievement, by ambition. If managers are truly convinced of the results that can be obtained, they may make the enormous effort required. The material results will be substantial, but the effort itself will be tedious and exhausting. The most favorable motive for making this effort is a desire to become a better person. When the driving force in the individual is an urge for personal growth and self-improvement, the experience becomes self-rewarding and self-motivating, independent of what other people say or do about it. It has been said, "If you want to raise a child, be prepared to be exhausted for five years." The process will be like that, exhausting but fully enjoyable and fulfilling in itself. Every person has a capacity to improve, sometimes vastly. The one essential thing is to really want it. It is up to each individual to choose. Many managers live a casual, carefree, relaxed existence that others may joke about behind their backs-one in which they continuously accommodate to the wishes of their subordinates, friends, and family, always adjusting to others, never deciding or willing for themselves, playful in their behavior, but often unhappy and insecure within. The alternative is a life of challenge and effort and continuous accomplishment, a briskness of energy, alertness of mind, clarity of thought-to be one who is respected by subordinates as an example to be followed, one who is supported by family members with ready cooperation, one whose natural disposition is happiness and whose normal reward in life is success. Those who do make the effort find that their professional life and private life are no longer separated by an artificial barrier of time or conflicting commitments. They reinforce and support each other and become integrated. The energy, freshness, and strength these individuals acquire in work spills over and removes much of the tension, flatness, and conflict in their personal lives as well. They become better people at home as well as at the office, better parents and spouses as well as better managers. It is not their work alone that is improved and uplifted, but their whole lives that are raised to a higher level of intensity and satisfaction. They become more significant individuals in the companies they work for and in their homes, too. Becoming a significant individual means identifying yourself fully with whatever work you do and giving yourself totally to it. The process of accomplishing the work and the process of improving yourself are the same. As Chris Steiner, of General Mills, said: "I think the biggest obstacle we can run into a lot of times is ourselves. It really demands a lot of energy. To do your job well, you really have to put a lot of yourself into it." It involves a commitment, an act of self-giving. As Sue Espinosa said: "You really get involved at Apple. You don't mean to, but you really do." And the result? John Machuzick, of General Mills, summed it up best: "I love it!" Earlier in this chapter we stated that in most companies the significant individual is the CEO. We can add here that anyone who makes the effort to become significant can become a CEO. If the company is stagnant, he or she rises to the top levels. If the company is growing, the individual grows with it until he or she acquires the level of authority and responsibility that the CEO once possessed at an earlier stage of the company's development. When managers make this effort, it is not their personal progress alone that is the result. The entire work for which they are responsible is energized and becomes more productive. They have attuned themselves to the central values of the corporation; therefore, the decisions they make and the actions they initiate are more likely to be in harmony with the overall direction of the company. They have discovered and developed their own inner capacities; therefore, they will be better able to identify and develop the hidden talents of their subordinates. "A superior who works on his own development sets an almost irresistible example," as Drucker said. They release inner springs of energy from their own personalities and express it in their work; therefore, they will be better able to release the energy of their subordinates, to excite and enthuse them, to help them grow, and to channel their energy into work. I believe the real difference between success and failure in a corporation can very often be traced to the question of how well the organization brings out the great energies and talents of its people. Self-development of the effective executive is central to the development of the organization....As executives work towards becoming effective, they raise the performance level of the whole organization. They raise the sights of people-their own as well as others'. A company that recognizes the unlimited reservoir of energy and talents it possess in its people and takes the personal growth of every individual within the company as a central value of the corporation will be constantly enlivened, invigorated, and carried upward by the perpetual flow of fresh energies emanating from its people.